Bushnell 716244 Banner 6-24x40 Mil Dot Reticle Riflescope 716244 FREE SHIPPING! This Bushnell Banner variable-power scope is specialized for early morning and late evening operations. Its lenses feature an advanced Dusk & Dawn Brightness multi-coating that is designed to provide maximum clarity and brightness in low-light conditions. The fast-focus eyepiece and variable power allow you to rapidly engage targets at both short and long distances, and the finely-adjustable, resettable fingertip windage and elevation controls make it easy to compensate for distance and crosswinds for pinpoint accurate shooting. The scope's one-piece tube is filled with nitrogen for total water and fogproofing, maintaining visibility in all weather conditions. 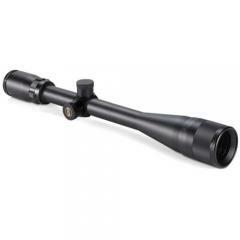 ©2002-2019 CopsPlus.com: Bushnell 716244 Banner 6-24x40 Mil Dot Reticle Riflescope 716244 FREE SHIPPING!